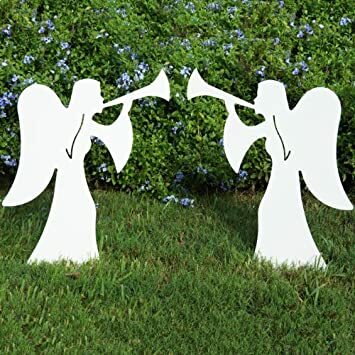 Beautiful silhouette style outdoor nativity angel set that complements any yard without looking overly commercial. These two angels are constructed of 1/2″ marine grade plastic sheet that cannot rot or delaminate and never requires painting. Angels measure 27.75″ tall x 23″ wide x 1/2″ thick (each) when assembled. Quick and simple assembly. Simply locate your stake and slide your angel on. Show off the reason for the season with this classic outdoor nativity set. Matches with standard nativity set (Amazon Part No. B00496GZ4G). Christmas Outdoor Reindeer Family. Buck – 53.75″ High x 14″ Wide x 37″ Long. Doe – 39.75″ High x 10.25″ Wide x 35″ Long. Baby – 18.5″ High x 8.5″ Wide x 27.5″ Long. Beautiful and Peaceful Christmas Deer Family Scene. Composed of marine grade plastic called “Proboard” this set will last many years. The material is designed to withstand the wear and tear of boats and salt water. It cannot rot or delaminate and never will require painting. It is 1/2″ thick to ensure stability. No fastener assembly required. No Screws just simple slide together assembly. Instructions are included. 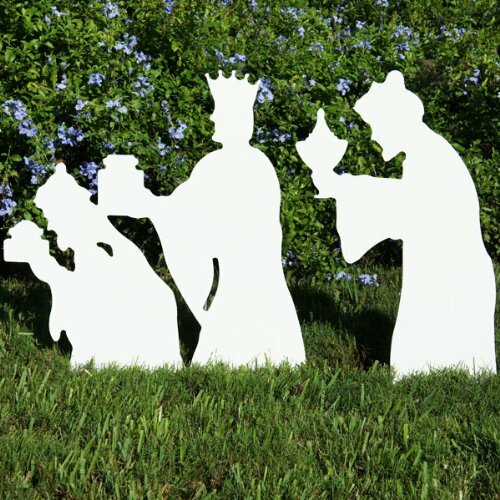 Beautiful silhouette style outdoor nativity wise men set that complements any yard without looking overly commercial. These wise men are constructed of 1/2″ marine grade plastic sheet that cannot rot or delaminate and never requires painting. Front 2 Wise Men Measure – 28.5″ x 27.4″ – Third Measure 28.75″ x 16.5″ Quick and simple assembly. Simply locate your stakes and slide the wise men on. Show off the reason for the season with this classic outdoor nativity set. Matches with standard nativity set (Amazon Part No. B00496GZ4G). Celebrate Easter with this beautiful sign of your faith and the resurrection of Jesus Christ. Constructed of welded aluminum and powder coated with marine grade white powder for years of use. 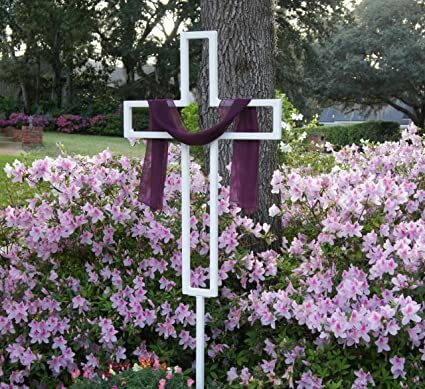 Cross measures 41″ tall x 27″ wide and is supported by a 41″ tall stake. Constructed of 1″ x 1″ extrusion. Great as an Easter decoration or for year-round use. Simple two bolt installation takes less than 2 minutes. Purple sash displayed in picture is not included. 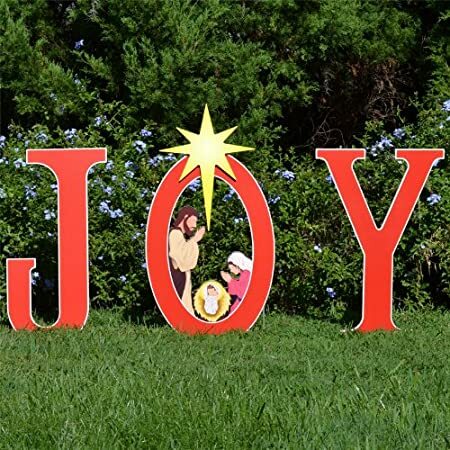 The Teak Isle Joy/Nativity printed yard sign is a beautiful display of the true joy of Christmas. Each large letter measures 35.5″ tall x 23.5″ wide (43.5″ to top of star). Composed of marine grade plastic designed to last many years. Exterior grade print provides years of use even in harsh winter weather. Our Best Selling Nativity Set, Now in Color! Made from exterior signage grade print to provide years of use in harsh winter weather. Assembled Dimensions: 46.5″ Wide x 50″ Tall x 23″ Deep. No fastener assembly and no screws necessary. Simple 30 second slide together assembly. Instructions are included, but generally not required as the set slides together so intuitively. This compact storage design requires minimal garage or attic space. Break your set down, slide it back in the box, & it is ready to go next year! 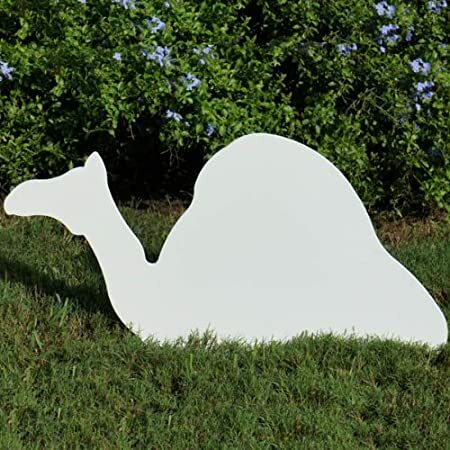 Beautiful silhouette style outdoor nativity Camel that complements any yard without looking overly commercial. The camel is constructed of 1/2″ marine grade plastic sheet that cannot rot or delaminate and never requires painting. Measure 22″ Tall x 41″ Wide x 1/2″ Thick when assembled. Quick and simple assembly. Simply locate your stake and slide your camel on. Show off the reason for the season with this classic outdoor nativity set. Matches with standard nativity set (Amazon Part No. B00496GZ4G). 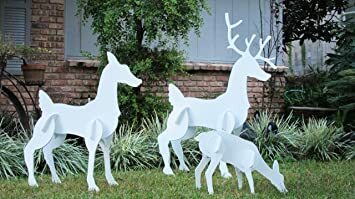 Beautiful silhouette style Shepherd set that complements any yard without looking overly commercial. The Shepherd is constructed of 1/2″ marine grade plastic sheet that cannot rot or delaminate and never requires painting. Measure 27.5″ tall x 33.25″ wide x 1/2″ thick . Quick and simple assembly. Simply locate your stake and slide the shepherd on. Show off the reason for the season with this classic outdoor nativity set. Matches with standard nativity set (Amazon Part No. B00496GZ4G). 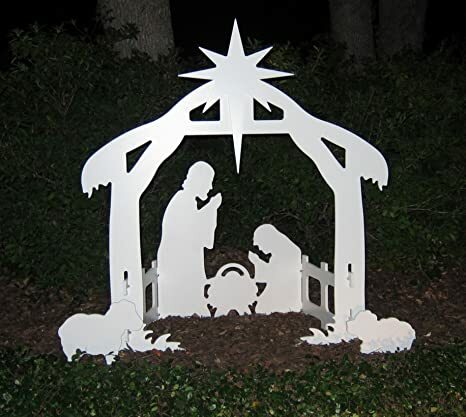 Beautiful silhouette style outdoor nativity set that complements any yard without looking overly commercial. These nativity scenes are constructed of marine grade white PVC sheet that can not delaminate and never needs painting. This eight piece set comes broken down for easy shipment and storage and measures 46 wide x 50 tall x 22 deep when assembled. Simple 30 second slide together assembly requires no screws or fasteners. Instructions are included but likely will not be needed as the set slides together very easily and intuitively. The entire set weighs less than 20 lbs making setup and breakdown handling quick and painless. An outdoor nativity scene has always been a great decoration for the Christmas holidays, however in the past it has been a bulky item and a pain to store for the other 11 months. Not anymore! New compact storage design allows the nativity set to store in a box or area as small as 45″ x 30″ x 3″. Show off the reason for the season with this classic outdoor nativity set. Holy Night Complete Printed Nativity Scene Buy the Complete Set and Save! The exterior signage grade print provides years of use in harsh winter weather. Composed of 1/2″ thick marine grade plastic sheet. 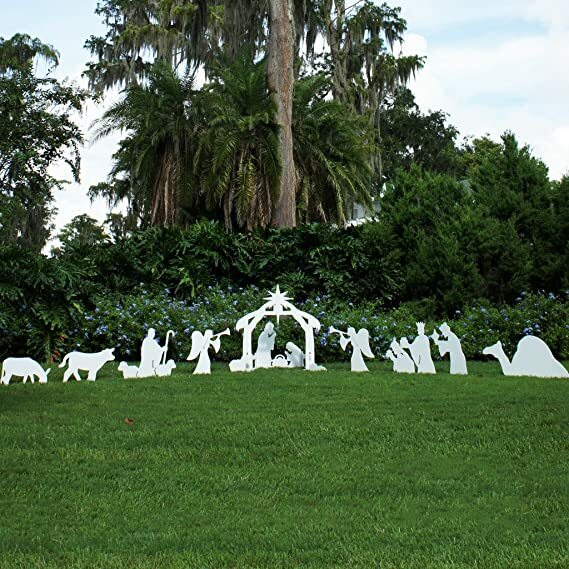 Beautiful silhouette style outdoor nativity set that complements any yard without looking overly commercial. Display the True Reason for the Season This nativity scene are constructed of 1/2″ marine grade plastic sheet that can not delaminate and never needs painting. 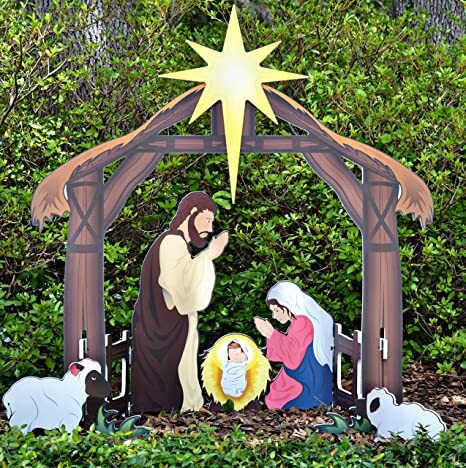 Holy Family and manger measures 50″ tall x 46″ wide x 22″ deep when assembled. Simple slide together assembly easily a 1 person job. Optional Screw on Stability Kit Ensures Set will Hold up in inclement weather. Instructions are included but likely will not be needed as the set slides together very easily and intuitively. An outdoor nativity scene has always been a great decoration for the Christmas holidays, however in the past it has been a bulky item and a pain to store for the other 11 months. Not anymore. New compact storage design allows the nativity set to store in 2 boxes 45″ x 30″ x 4″. 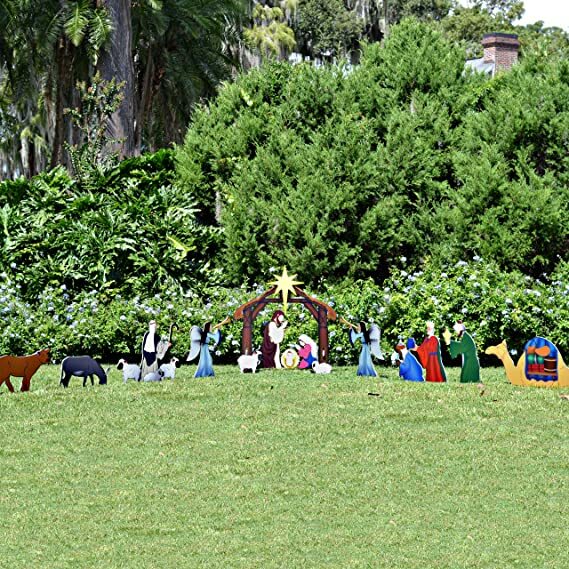 Show off the reason for the season with this classic outdoor nativity set. Believe Holy Family Outdoor Nativity Set. This is a Brand New Design for 2013! A beautiful silhouette style complements any yard without looking overly commercial. Assembled Dimensions: Joseph – 40.5″ Tall x 20″ Wide x .5″ thick, Mary – 36.75″ Tall x 21.25″ Wide x .5″ Thick, Manger- 27″ Tall x 39.5″ Wide x .5″ Thick. The simple bracket & stake assembly takes only minutes! This compact storage design requires minimal garage or attic space. Break your set down, slide it back in the box, & it is ready to go next year! 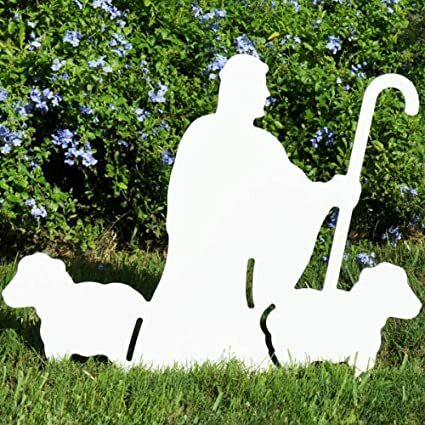 Beautiful silhouette style outdoor Christmas joy nativity sign that complements any yard without looking overly commercial. Constructed of 1/2″ marine grade plastic sheet that cannot rot or delaminate and never requires painting. Quick and simple assembly. Simply locate your stakes and slide the letters on. Show off the reason for the season with this classic outdoor nativity set.